Aleyagarden plants : wholesale shipments: Plant packing : freshness, shade and aeration are important matters. Plant packing : freshness, shade and aeration are important matters. Aleyagarden is a nursery under trees, close to the sea in Phang Nga, on a land reserved by law to agriculture. It is a generally cloudy and always slightly windy area of Southern Thailand where forests and hills make it a fresh place. The air has a high moisture content, which alleviates the stress on the bare rooted plants while being packed. March is the month of most plant shipments to the northern hemisphere and is also the month of the end of the dry and hot season. The start of the rainy season comes earlier in Phang Nga than in most other provinces of Thailand. Meteo yearly data show that on average temperatures in Phang Nga are slighly lower than in Central Thailand. So when Aleyagarden pack plants in March chances are high that they do it a cloudy day, if not a rainy one, temperature is low and thanks to the high humidity of the air the bare root plants adjust slowly to their new environment in bags. But they can't just count on the weather ! Aleyagarden has conceived an infrastructure on the site of a hevea plantation that generates shade ( see the packing place above ), low temperature and aeration. 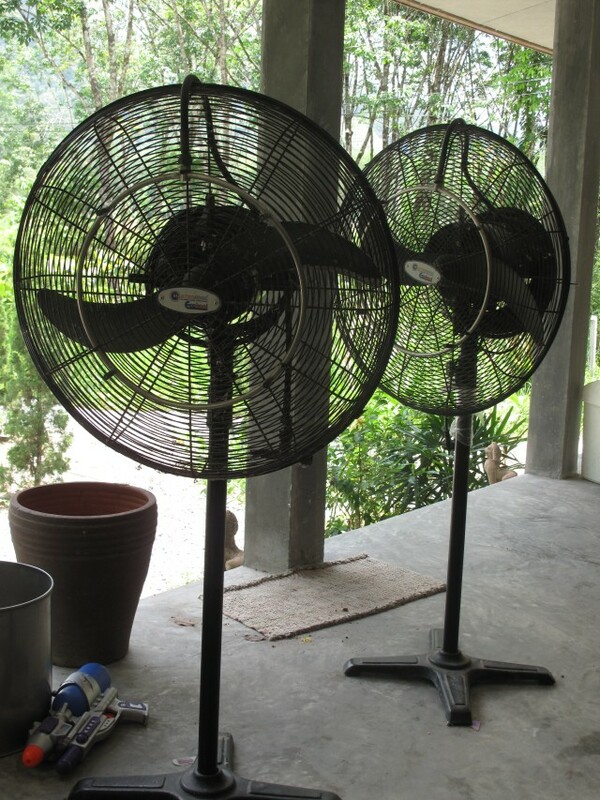 Additionally these two refreshing fans in picture may be employed during the hottest days of the dry season, that could occur in the month of February ( but the chances are slim, this month is usually cold ). Aleyagarden uses fans and trees instead of classical air conditionning device. Aeration is guaranteed by the trees that have recovered their leaves before March when shipments are done. Before they are put in cartons the plants have to get rid of excessive water : this is done under Aleyagarden house, on numerous large pallets. In this special place freshness, low light and aeration are always guaranteed. Packing operations must be undergone fast : Aleyagarden is fortunate that many residents work in the very early morning ( they usually start at 3 am ) on their hevea plantations, so they still have time during the day for our ornamental plant packing. Aleyagarden is very grateful to them.